"Middot" redirects here. For the religious tractate, see Middot (Talmud). An interpunct (·), also known as an interpoint, middle dot, middot, and centered dot or centred dot, is a punctuation mark consisting of a vertically centered dot used for interword separation in ancient Latin script. (Word-separating spaces did not appear until some time between A.D. 600 and 800.) It appears in a variety of uses in some modern languages and is present in Unicode as code point U+00B7 · MIDDLE DOT (HTML &#183; · &middot;). The multiplication dot or dot operator U+22C5 ⋅ DOT OPERATOR (HTML &#8901; · &sdot;) indicates multiplication and is optionally used instead of the styled × for multiplication of real numbers: a ⋅ b is equivalent to a × b or "a times b". The same sign is also used in vector multiplication to discriminate between the scalar product (a ⋅ b) and the vector cross product (a × b) or exterior product (a ∧ b). As a multiplication operator, it is also encountered in symbols for compound units such as the newton-meter (N·m or N⋅m). The multiplication dot is a separate Unicode character (U+22C5), but is often silently replaced by the interpunct or bullet (U+2022 • BULLET (HTML &#8226; · &bull;)), another similar glyph which is intended for lists. Various dictionaries use the interpunct (in this context, sometimes called hyphenation point) to indicate syllabification within a word with multiple syllables. There is also a separate Unicode character, U+2027 ‧ HYPHENATION POINT. In British typography, the space dot is an interpunct used as the formal decimal point. Its use is advocated by laws and by academic circles such as the Cambridge University History Faculty Style Guide and is mandated by some UK-based academic journals such as The Lancet. When the British currency was decimalised in 1971, the official advice issued was to write decimal amounts with a raised point (for example, £21·48) and to use a decimal point "on the line" only when typesetting constraints made it unavoidable. This usage, however, has been declining since the mid-1970s, as the importation of electronic typewriters, calculators and computers from the United States and Japan familiarised Britons with using full stops and made the space dot harder to typeset. The space dot may still be used frequently in handwriting, however. In the early modern era, periods were sometimes written as interpuncts (for example in the handwritten Mayflower Compact). In the Shavian alphabet, interpuncts replace capitalization as the marker of proper nouns. The dot is placed at the beginning of a word. 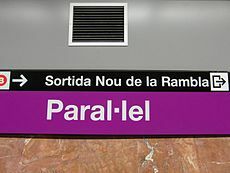 The punt volat ("flying point") is used in Catalan between two Ls in cases where each belongs to a separate syllable, for example cel·la, "cell". This distinguishes such "geminate Ls" (ela geminada), which are pronounced [ɫː], from "double L" (doble ela), which are written without the flying point and are pronounced [ʎ]. In situations where the flying point is unavailable, periods (as in col.lecció) or hyphens (as in col-lecció) are frequently used as substitutes, but this is tolerated rather than encouraged. Historically, medieval Catalan also used the symbol ⟨·⟩ as a marker for certain elisions, much like the modern apostrophe (see Occitan below), and hyphenations. There is no separate keyboard layout for Catalan: the flying point can be typed using ⇧ Shift+3 in the Spanish (Spain) layout. It appears in Unicode as the letters ⟨Ŀ⟩ (U+013F) and ⟨ŀ⟩ (U+0140), but they are compatibility characters and are not frequently used or recommended. Similarly, the larger bullet (⟨•⟩, U+2022, &bull;) may be seen but is discouraged on aesthetic grounds. The preferred Unicode representation is ⟨l·⟩ (U+006C + U+00B7). The interpunct is used in Chinese (which generally lacks spacing between characters) to mark divisions in transliterated foreign words, particularly names. This is properly (and in Taiwan formally) a full-width partition sign (Unicode code point U+2027, Hyphenation Point), although sometimes narrower forms are substituted for aesthetic reasons. In particular, the regular interpunct is more commonly used as a computer input, although Chinese-language fonts typically render this as full width. When the Chinese text is romanized, the partition sign is simply replaced by a standard space or other appropriate punctuation. Thus, William Shakespeare is signified as 威廉·莎士比亞 or 威廉·莎士比亞 (p Wēilián Shāshìbǐyà), George W. Bush as 喬治·W·布殊 or 喬治·W·布什 (p Qiáozhì W. Bùshí), and the full name of the prophet Muhammad as 阿布·卡西木·穆罕默德·本·阿布杜拉·本·阿布杜勒-穆塔利卜·本·哈希姆 (p Ābù Kǎxīmù Mùhǎnmòdé Běn Ābùdùlā Běn Ābùdùlè-Mùtǎlìbǔ Běn Hāxīmǔ). Titles and other translated words are not similarly marked: Genghis Khan and Elizabeth II are simply 成吉思汗 and 伊利沙伯二世 or 伊麗莎白二世 without a partition sign. The partition sign is also used to separate book and chapter titles when they are mentioned consecutively: book first and then chapter. In Pe̍h-ōe-jī for Taiwanese Hokkien, middle dot is often used as a workaround for dot above right diacritic because most early encoding systems did not support this diacritic. This is now encoded as U+0358 ͘ COMBINING DOT ABOVE RIGHT (see o͘). Unicode did not support this diacritic until June 2004. Newer fonts often support it natively; however, the practice of using middle dot still exists. Historically, it was derived in the late 19th century from an older barred-o with curly tail as an adaptation to the typewriter. In Tibetan the interpunct ་, called ཙེག་ (tsek), is used as a morpheme delimiter. The Ge'ez (Ethiopic) language uses an interpunct of two vertically aligned dots, like a colon, but with larger dots. An example is ገድለ፡ወለተ፡ጴጥሮስ. Ancient Greek did not have spacing or interpuncts but instead ran all the letters together. By Late Antiquity, various marks were used to separate words, particularly the Greek comma. The modern Greek ano teleia mark (άνω τελεία, ánō teleía, lit. "upper stop"), also known as the áno stigmī́ (άνω στιγμή), is the infrequently-encountered Greek semicolon and is properly romanized as such. It is also used to introduce lists in the manner of an English colon. In Greek text, Unicode provides a unique code point—U+0387 · GREEK ANO TELEIA—but it is also expressed as an interpunct. In practice, the separate code point for ano teleia canonically decomposes to the interpunct. The Hellenistic scholars of Alexandria first developed the mark for a function closer to the comma, before it fell out of use and was then repurposed for its present role. Interpuncts are often used to separate transcribed foreign names or words written in katakana. For example, "Can't Buy Me Love" becomes 「キャント・バイ・ミー・ラヴ」 (Kyanto·bai·mī·ravu). A middle dot is also sometimes used to separate lists in Japanese instead of the Japanese comma ("、" known as tōten). Dictionaries and grammar lessons in Japanese sometimes also use a similar symbol to separate a verb suffix from its root. Note that while some fonts may render the Japanese middle dot as a square under great magnification, this is not a defining property of the middle dot that is used in China or Japan. However, the Japanese writing system usually does not use space or punctuation to separate words (though the mixing of katakana, kanji, and hiragana gives some indication of word boundary). U+30FB ・ KATAKANA MIDDLE DOT, with a fixed width that is the same as most kana characters, known as fullwidth. The interpunct also has a number of other uses in Japanese, including the following: to separate titles, names and positions: 課長補佐・鈴木 (Assistant Section Head · Suzuki); as a decimal point when writing numbers in kanji: 三・一四一五九二 (3.141 592); as a slash when writing for "or" in abbreviations: 月・水・金曜日 (Mon/Wed/Friday); and in place of hyphens, dashes and colons when writing vertically. Interpuncts are used in written Korean to denote a list of two or more words, more or less in the same way a slash (/) is used to juxtapose words in many other languages. In this role it also functions in a similar way to the English en dash, as in 미·소관계, "American–Soviet relations". The use of interpuncts has declined in years of digital typography and especially in place of slashes, but, in the strictest sense, a slash cannot replace a middle dot in Korean typography. U+318D ㆍ HANGUL LETTER ARAEA (아래아) is used more than a middle dot when an interpunct is to be used in Korean typography, though araea is technically not a punctuation symbol but actually an obsolete Hangul jamo. Because araea is a full-width letter, it looks better than middle dot between Hangul. In addition, it is drawn like the middle dot in Windows default Korean fonts such as Batang. The interpunct (INTERPVNCTVS) was regularly used in classical Latin to separate words. In addition to the most common round form, inscriptions sometimes use a small equilateral triangle for the interpunct, pointing either up or down. It may also appear as a mid-line comma, similar to the Greek practice of the time. The interpunct fell out of use c. AD 200, and Latin was then written scripta continua for several centuries. Although it is considered to be a spelling error, a period is frequently used when a middle dot is unavailable: des.har, in.hèrn, which is the case for French keyboard layout. O no·i vei clar dels olhs ab que·us remir. or else the eyes I see you with have dimmed. In many linguistic works discussing Old Irish (but not in actual Old Irish manuscripts), the interpunct is used to separate a pretonic preverbal element from the stressed syllable of the verb, e.g. do·beir "gives". It is also used in citing the verb forms used after such preverbal elements (the prototonic forms), e.g. ·beir "carries", to distinguish them from forms used without preverbs, e.g. beirid "carries". In other works, the hyphen (do-beir, -beir) or colon (do:beir, :beir) may be used for this purpose. Runic texts use either an interpunct-like or a colon-like punctuation mark to separate words. There are two Unicode characters dedicated for this: U+16EB ᛫ RUNIC SINGLE PUNCTUATION and U+16EC ᛬ RUNIC MULTIPLE PUNCTUATION. In SI units the middle dot or non-breaking space is used as a multiplication sign. Only a comma or full stop (period) may be used as a decimal marker. In mathematics, a small middle dot can be used to represent product; for example, x ∙ y for the product of x and y. When dealing with scalars, it is interchangeable with the multiplication sign: x ⋅ y means the same thing as x × y, but × is easily confused with the letter x. However, when dealing with vectors, the dot product is distinct from the cross product. This usage has its own designated code point in Unicode, U+2219 (∙), called the "bullet operator". It is also sometimes used to denote the "AND" relationship in formal logic, due to the relationship between these two operations. Another usage of this symbol is in functions, denoting a parameter, which varies, for example, θ(s,a,·). In situations where the interpunct is used as a decimal point (as noted above, by many mathematics teachers in some countries[weasel words]), then the multiplication sign used is usually a full stop (period), not an interpunct. In computing, the middle dot is usually used to indicate white space in various software applications such as word processing, graphic design, web layout, desktop publishing or software development programs. In some word processors, interpuncts are used to denote not only hard space or space characters, but also sometimes used to indicate a space when put in paragraph format to show indentations and spaces. This allows the user to see where white space is located in the document and what sizes of white space are used, since normally white space is invisible so tabs, spaces, non-breaking spaces and such are indistinguishable from one another. In chemistry, the middle dot is used to separate the parts of formulas of addition compounds, mixture salts or solvates (mostly hydrates), such as of copper(II) sulphate pentahydrate, CuSO4 · 5H2O. A middot may be used as a consonant or modifier letter, rather than as punctuation, in transcription systems and in language orthographies. For such uses Unicode provides the code point U+A78F ꞏ LATIN LETTER SINOLOGICAL DOT. In the Sinological tradition of the 36 initials, the onset 影 (typically reconstructed as a glottal stop) may be transliterated with a middot ⟨ꞏ⟩, and the onset 喩 (typically reconstructed as a null onset) with an apostrophe ⟨ʼ⟩. Conventions vary, however, and it is common for 影 to be transliterated with the apostrophe. These conventions are used both for Chinese itself and for other scripts of China, such as ʼPhags-pa and Jurchen. In Americanist phonetic notation, the middot is a more common variant of the colon ⟨꞉⟩ used to indicate vowel length. It may be called a half-colon in such usage. Graphically, it may be high in the letter space (the top dot of the colon) or centered as the interpunct. From Americanist notation, it has been adopted into the orthographies of several languages, such as Washo. In the writings of Franz Boas, the middot was used for palatal or palatalized consonants, e.g. ⟨kꞏ⟩ for IPA [c]. In the Canadian Aboriginal Syllabics, a middle dot ⟨ᐧ⟩ indicates a syllable medial ⟨w⟩ in Cree and Ojibwe, ⟨y⟩ or ⟨yu⟩ in some of the Athapascan languages, and a syllable medial ⟨s⟩ in Blackfoot. However, depending on the writing tradition, the middle dot may appear after the syllable it modifies (which is found in the Western style) or before the syllable it modifies (which is found in the Northern and Eastern styles). In Unicode, the middle dot is encoded both as independent glyph U+1427 ᐧ CANADIAN SYLLABICS FINAL MIDDLE DOT or as part of a pre-composed letter, such as in U+143C ᐼ CANADIAN SYLLABICS PWI. on Microsoft Windows, it can be inserted by pressing Alt+250 or Alt+0183 (on the numeric keypad). The default shortcut using Azerty Greek polytonic keyboard layout (EL) is AltGr+⇧ Shift+$. Characters in the Symbol column above may not render correctly in all browsers. ^ Thanks Catich, Edward (1991). The Origin of the Serif: Brush Writing and Roman Letters. Des Moines, Iowa: Saint Ambrose University Catich Gallery. ISBN 978-0-9629740-1-4. ^ "Cambridge University History Faculty Style Guide 2010". Retrieved 2014-01-12. ^ "The Lancet – Formatting guidelines for electronic submission of manuscripts" (PDF). Retrieved 2017-04-25. ^ "CNS11643 中文全字庫-字碼查詢與下載" (in Chinese). Cns11643.gov.tw. Retrieved 2013-04-22. ^ a b c d "Thesaurus Linguae Graecae". www.tlg.uci.edu. Archived from the original on 2012-08-06. Retrieved 2011-01-10. ^ Unicode. "Unicode Greek code chart", pp. 34, 36. ^ Thurneysen, Rudolf. A Grammar of Old Irish. trans. D. A. Binchy and Osborn Bergin. Dublin Institute for Advanced Studies. p. 25. ISBN 1-85500-161-6. ^ Pakin, Scott (9 November 2009). "The Comprehensive LATEX Symbol List" (PDF). Archived from the original (PDF) on 28 March 2015. Retrieved 2015-03-19. ^ Bowen, Jonathan P. (May 1995). "Glossary of Z Notation". Information and Software Technology. University of Reading (UK). Retrieved 2015-03-19. ^ West, Andrew (4 April 2009). Unicode Technical Committee (ed.). "Proposal to encode a Middle Dot letter for Phags-pa transliteration (UTC Document L2/09-031R, ISO/IEC JTC1/SC2/WG2 Document N3567)" (PDF). ^ Anderson, Deborah; Everson, Michael (2001-10-03). "N2378: Final proposal to encode Aegean scripts in the UCS" (PDF). ISO/IEC JTC1/SC2/WG2. Retrieved 2015-03-19.